Photo shows Annie(seated with baby)and four of her eight children. 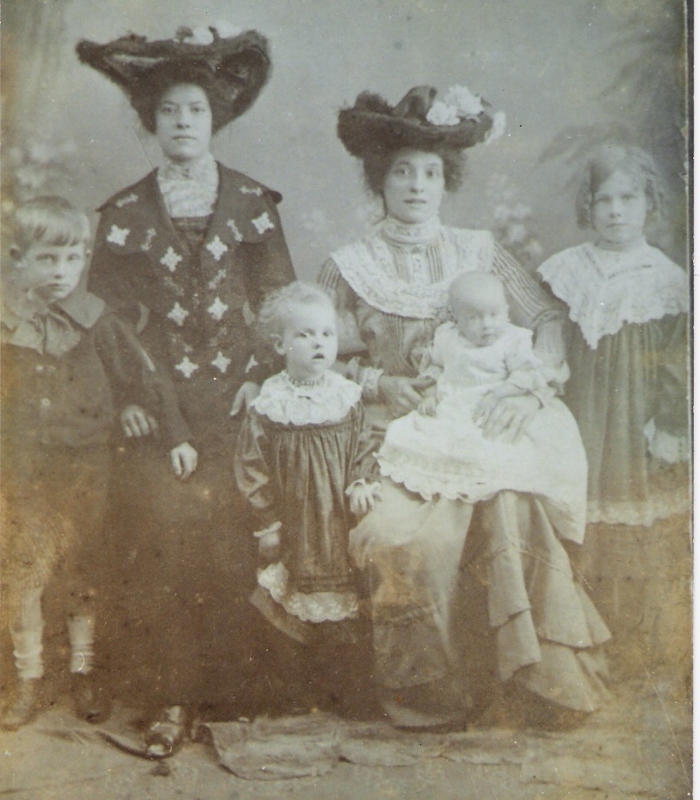 Also, standing, her younger sister Kate Louise, who died shortly after this photo was taken. Annie Harvey (neé Gandey) my great grandmother, lived and died in the Hanover area of Brighton. She was born at 5,Claremont Place in 1879, and died a few streets away in Lincoln Street. Her occupation was Ironer, which along with laundress was typical of the manual jobs open to poor women at that time. She had eight children, all of whom survived into adulthood and old age. When she died aged 42 years in 1920 of ‘consumption’ (tuberculosis) her youngest child was just three years old. These days we take anti-biotics for granted. It is difficult to imagine having to live without them, and the struggle just to survive and raise a family. Hi Jane, I am related to Annie Harvey (nee Gandey) – her parents, William & Mary, are my GGG Grandparents! My line is through her older brother, William Gandey Jnr (my GG Grandfather). His daughter was named Kate Louisa after his sister. Kate Louisa (my G Grandmother) also sadly passed away from ‘consumption’ in her early 20s. Would love to to know if we can share any information on the Gandeys…? William and Annie’s mother, Mary also died of ‘consumption’, (TB), aged just 37yrs. The men in the family seem to have escaped the disease,or perhaps were stronger, and were able to live with it. Annie’s father died aged 46yrs, but of cardiac disease, no memtion of TB. I would also love to get in touch and share more information. I have recently been researching (with some difficulty) families of Gandey in Brighton. William and Annie mentioned in previous postings were the eldest children of William, born 1857, and Mary Lewery. My own line is connected by Ann Gandey marrying Horace Whitcombe in 1889. Her parents wer George, born 1831, and Sarah Virgo. Until recently I hadn’t been able to connect up the various families which I have researched from a number of sources. These include old street directories of Brighton where the information wasn’t as helpful as I thought it would be. For instance there was A.C.Gandey & Co wine and spirit merchants in Western Road in early 1900s who I can only trace as being Alfred Charles Gandey who had two marriages in the States and died in Brighton in 1901. I don’t think he had a son to take over the business if it was him. I’ll gladly list some of the family lines I have researched if there is interest. Hi, I come from a long line of Brighton Gandey’s.